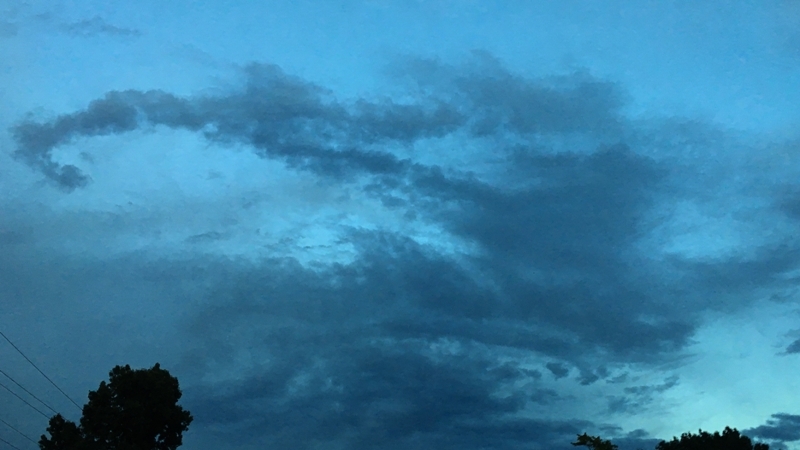 In asking for guidance yesterday evening, I was offered a skyscape (which I was lucky enough to be able to capture in the above photo) that once again offered a message that was bigger than me. The entire weekend has, in general, consistently offered skyscapes with intense cloud formations swirling in the foreground while a deep and vivid blue remains present in the background. What strikes me about this skyscape is that, even at a late hour, the space behind this dark and dynamic formation still glows with that deep and vivid blue. The endless space behind a cloud formation is often I typically experience as overarching foundation, the larger collective, or the long-term “big picture.” In the above skyscape, it offers guidance and context for both our personal paths and our larger collective journey. There is a lot of energy being directed toward the collective right now. Fuel is being directed toward needed changes, vivid light shown on areas that need tending from our community as a whole, and a blue pool of healing resources gathering for where change and needed attention may result in the type of pain we individually and collective feel when pulled from our comfort zones. The foreground shows where we are collectively and individually circling upcoming shifts but have yet to land on where we’re needed in the bigger picture or in our personal paths. That circling and lack of cohesion will be felt this week as a sort of waiting pattern and a sense that our personal agenda is greatly slowed by bigger energies at work on bigger things. Those who still feel noticeable and productive movement on personal goals can be assured that this is due to their personal path being very much in alignment with what is needed at a collective level. Those feeling stalled need not worry about the feeling being permanent. What we want to manifest personally may be more impactful and longer lasting if delayed so that it may better serve the collective at the ideal time, and the global ancestors, land elders, and guides of our global ship have taken a firm grip at the helm for right now. How can I best use my energy this week, knowing that my personal agenda may be slowed or even halted for a period of time? Is there specific personal work within my long term goals that would be ideal to complete during this potential lull in the action? Where might I be led to devote my energy to the greater collective this week, in order to help the pace of our global shift and ultimately help to make space and clarify context for personal agendas? Would you like a personal sky reading or other intuitive healing work facilitated by Brandice? Schedule a intuitive intake appointment today. Online or in-person sessions are available. clouds, collective, community, divination, personal goals, shamanism, sky reading, sky speak. Bookmark.